Here at Susan Chen DDS, we understand your desires even better then you. We are the top Fre,pmt Cosmetic Dentists. We seek to achieve the best esthetic results possible with today’s technology. We use the best materials, equipment and lab products to achieve a beautiful smile you can wear for years to come. We understand you want the best and that is exactly what you get, you can not find a better looking product, period. Each case is customized for that individual from color, to shape and feel. In other words, we do not use a cookie cutter system to save of cost. Come in for a free consultation so we can make your desire a reality! If dentures are still your best option and you want the most life-like and natural result possible, then Dr. Lam’s Cosmetic Dentures is the answer. Dr. Lam designs the denture to fit your facial shape and personality. Your teeth are so real that even dentists are fooled. Professional, in-office Power Teeth Bleaching technology is the most researched and scientifically proven way to whiten the teeth in the shortest time and the greatest number of shades. After little over an hour, your teeth are far whiter than they ever were. Years of smoking, coffee, and age can be erased. Touch-up treatments are needed since the teeth do continue to age along with the rest of you! We are running a 50% OFF Specials for Teeth Whitening! 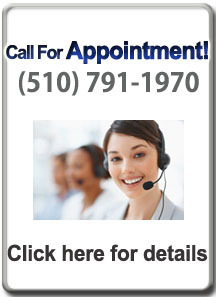 Call the friendliest Fremont Dental Clinic at (510) 791-1970 for details!.